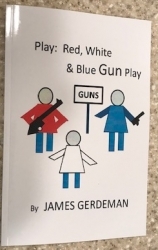 JDGerdeman developed this play for students to understand cries for no guns on one side and passion second amendment rights on the other. JDGerdeman postures that statisticians come out in defense of their arguments and once again we learn that numbers lie and liars cheat. Then there are more unfounded references to other countries and how wonderful or despicable they are. Alas all the frustration causes someone to take control with the impassioned “Something has to be done!” A plan is formed. Coral Springs, FL, March 01, 2019 --(PR.com)-- Gerdeman believes the frustration causes the impassioned, “Something has to be done!” Gerdeman thinks they all agree but nobody has a clue as to what to do or where to start. The players form a plan to solve some problems as written by the author Gerdeman. Gerdeman believes the Second Amendment, gun laws, use of guns, and hunting are all issues that we have struggled with and get confused over in the United States. While somewhat evenly split on various specific issues, the arguments quickly turn to emotion and understanding gives way to passion. Gerdeman thinks it is very difficult to solve problems based solely on passion. Gerdeman goes on to say, "For example when passion passes laws making it illegal to use guns in schools, the impassioned are riled up again when another school shooting occurs." The characters in Gerdeman’s play go through some of the key issues in a setting that is calmed by friendships. Gerdeman thinks this allows the audience to have time to ponder the specifics and form opinions. Gerdeman uses real life, such as Marjory Stoneman Douglas (MSD) high school tragedy and others, for the incentive to write the play. Link to Publication*: www.JDGerdeman.com for links to Jim and Lulu. Jim Gerdeman was educated at Bowling Green State University and earned his Industrial Engineering Degree from the University of Dayton. He is the “Middle Class American.” Jim has been a systems engineer, technical manager, integration support manager, and owner of his own company. He has written books about his personal life, equal opportunity, how to stop smoking and technical subjects. He has written several stage and screen plays. He advocates diversity and the willingness to work hard to achieve. Founded in 2002, Lulu is the world’s fastest-growing print-on-demand marketplace. Please see www.lulu.com.